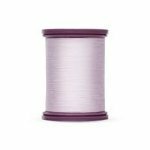 Cotton+Steel Thread by Sulky is 50 wt 100% long-staple Egyptian grown cotton that is spun in Egypt and dyed in Italy. It's been meticulously tested both in the lab and by home sewists to it's the highest quality for piecing, quilting and general sewing. Cotton+Steel has chosen a hundred vibrant colors that will coordinate with any sewing project, especially Cotton+Steel fabrics. The thread is wrapped on multicolored spools and we designed twelve different playful labels, so everything together is really a nice dose of eye candy!